This pictorial guide is intended to show you the easiest way to look good in basic 1640s kit. It’s not a comprehensive description of the clothes worn in the civil wars. It can’t be. There is no such thing. There are so few remaining examples of clothes from this period and so little pictorial or written evidence to show what was worn by the soldiers from, (and those women who chose to follow), the armies in the three kingdoms of the wars of the 1640s that most conclusions can only be best guesses. You won’t find any dos and don’ts here. The guide assumes that anyone reading this will know for example not to wear modern shoes or show their facial piercings. If you follow these guidelines you will end up with a basic set of kit that is, as far as we can tell at present, accurate in the fashion of the times, method of construction and use of fabric. It will help you to look and feel more like someone who has just stepped out of the past than a person in fancy dress. In the 1640s, the two fabrics mostly used for common clothes were woven wool, which was often felted with a fuzzy nap on the surface and natural coloured linen. Both fabrics are, at the time of writing, available from suppliers so there should be no excuse for making or buying garments made from anything else. These natural fabrics are practical and hardwearing and will give you clothes that will last for years if you look after them. There were no detergents to wash clothes, and outer garments were generally not washed at all but brushed occasionally to remove surface dirt. Most clothes would end up with a patina of ingrained dirt from campaigning, though it’s reasonable to assume that linens would be washed on a regular basis. Although there was white linen in these times, the serving soldier would not often have access to this kind of cloth, so make sure you don’t end up with the modern ‘whiter than white, neatly pressed’ look. The range of colours available was quite broad, but the less well off (the best part of any seventeenth century army) made use of very few of them. Their clothes were also often so old and reused that they had faded to dull grey or brown or had been re-dyed several times. For the armies, the regimental colonels chose their soldiers’ coat colours, based on personal preference and whatever was available locally. You can find out from your regiment which colour is correct for your coat and breeches, though an important thing to remember is that apart from a very few documented instances at specific times of the civil wars, soldiers were never identically dressed. The following colours are suitable for general purpose: grey, brown, terracotta or brick, russet reds, grey-blue or dark blues, dull shades of green, mustard yellow-ochre, heathery shades of purple, and cream (undyed). Details and accessories are also important to create the overall look. Make sure any BUTTONS conform to the 1640s style , small, round ball shaped buttons with a single shank or stalk to attach to the garment, either metal, cloth or wooden beads wrapped with thread. Don’t choose wide belts with massive buckles. Seventeenth century belts were no wider than two fingers and the buckles were of a matching size. 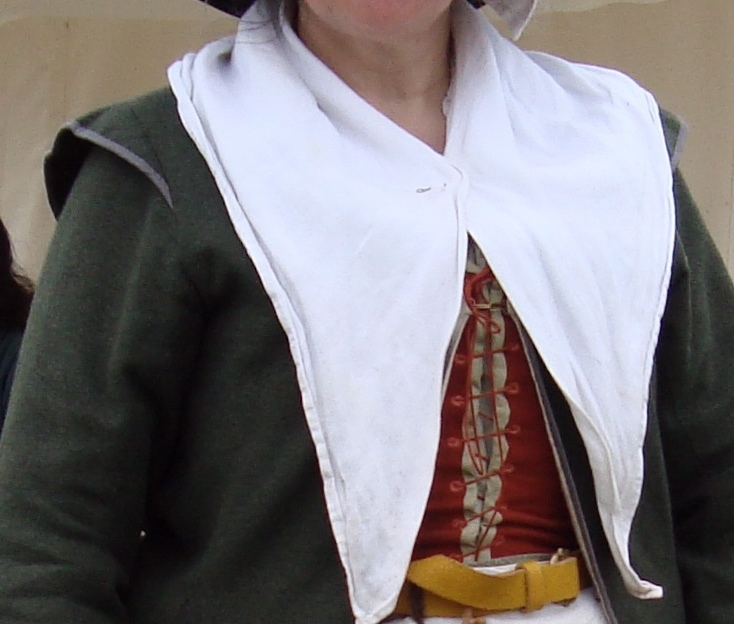 Belts were worn over the coat/doublet to hold a bag, not to keep your breeches up. 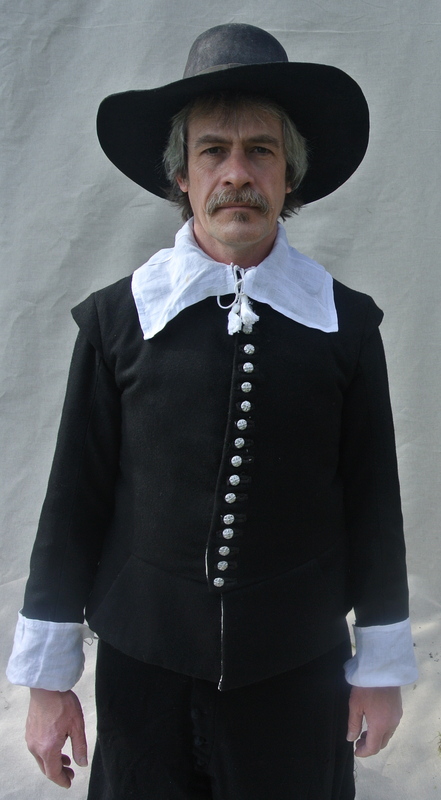 Try and feel comfortable in your chosen clothes and act like a seventeenth century person would in them; always wear your hat, keep the top buttons fastened and don’t go out in just a smock. Wearing just a shirt and breeches was acceptable for a labourer working in the sun, but probably no one else! Be proud of your clothes, as they will provide you with protection and warmth. Don’t leave them to go ragged – patch them up when they tear, keep the linen clean and the wool brushed when it gets muddy. Do some of your own research, read books and look at images from the time. Ask for help if you are unsure. If you see something on trader’s row that doesn’t match what is shown here find out why. It’s better to ask than to buy the wrong kit and waste your money on something you don’t need. The universal women’s undergarment was the SHIFT or SMOCK, a long-sleeved T-shaped garment of varying quality linen reaching to mid-calf. It was generally cut loosely and had long triangles, known as gores, set in to the sides. For obvious reasons, there are few contemporary images of women in their under-things, though what woodcuts there are show women in smocks with high necklines and single slit openings. Surviving high status examples in museum collections conform to this pattern. Tapes, attached to the neckband, were used to fasten the neckline whilst tapes or small buttons can be used to fasten cuffs. There is no evidence for drawstrings around the neck in this period. Any gathering would have been permanent and sewn to a neckband. There is also pictorial evidence to suggest that smocks were also used as night clothes. Over the smock you would wear A PAIR OF BODIES, a boned BODICE or a PETTICOAT WITH ATTACHED BODIES. These were in decreasing order of status and will be dealt with in separate sections. 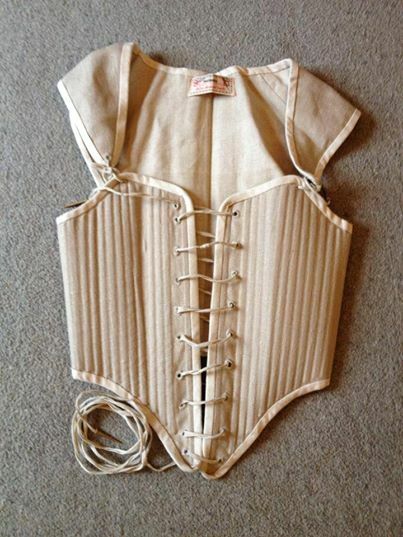 Firstly, A PAIR OF BODIES was an undergarment stiffened with canvas, reed or whalebone, which would make anyone wearing them conform to the fashionable mid-seventeenth century shape, something that is obvious from original pictures of the period. They would not have been uncomfortable but would hold the torso and give a straight lined, conical shape to your body. Bodies were usually made of layers of linen, with the stiffening inserted into sewn channels in the fabric. Many people find back-laced bodies tricky to lace up and it is thought that front-laced styles, being easier to manage, were more often worn by women who would have had no help in dressing themselves. Shoulder straps could be either integral or made as separate pieces laced in when worn. The boning would reach into the tabs at the bottom of the bodies, which could be tucked under the skirts to support the petticoat. Over bodies, a BODICE or WAISTCOAT was worn, although as stated above, you can wear a boned bodice on its own. Both are made of wool, or linen and lined. A BODICE may have had a high or medium neckline, with full or close-fitting sleeves and tabs below the waistline. It can be fastened with buttons, tapes or hooks and eyes, though buttons are less common for women’s clothes than men’s. If you wear a bodice over stays, you still need to bone the front edges to prevent puckering when you fasten it. Otherwise more boning needs to be sewn into the lining of the bodice to help you form the correct shape. WAISTCOATS started as a lower status items, and are common in contemporary images from the 1640s, as they were becoming fashionable informal wear for most women. Generally worn over the petticoat and body combination, they were fastened up the front in the same way as bodices. The sleeves could be full or close fitting. They were collarless and they accommodated the fullness of the hips by added triangular gores, rather than the separate tabs used in bodices. A waistcoat would not be boned, but the front edges could be stiffened with boning or heavy canvas strips sewn into the lining. You would not go out in public with only a smock covering your upper body (even lowly women wouldn’t dare to attract THAT kind of attention in this period! ), so you must wear at least a bodice or waistcoat. Over the bodice and smock women wore a PETTICOAT, basically what we now think of as a skirt, but there is good evidence to suggest that in this period that the skirts were often attached to a sleeveless, front opening, upper body section. This was the bottom of the range as it were, and if you had a body attached to your petticoat, you would cover it with a waistcoat. Petticoat bodies were probably stiffened or interlined and either sewn to the skirts or joined with laces. In this configuration, the skirts would be front opening and the join covered with the waistcoat skirts and an apron. If you were of higher status your petticoat would just have a waistband and skirts and probably a rear fastening. Pictures show petticoats worn with bodice tabs either tucked under or covering the band. The choice is yours. The petticoat would be made of wool or linen and if your cloth is thick, full and heavy enough, you can wear a single skirt, though often more than one layer was worn, especially in winter. The hem should be above your ankle as most women wore their skirts relatively short to keep them well out of the muck. The fabric of the skirts would be gathered and fixed to a waistband. At the front a hands-breadth width was often left unpleated for comfort. Gathers will provide enough fullness for a seventeenth century shape as long as enough fabric is used, 3-4m being a decent length. Cartridge pleats are best for full skirts but not essential. Petticoats were fastened, either with plain round (metal or cloth) shanked buttons, hooks-and-eyes or laces. The bottom edge would be hemmed and contemporary pictures show lines of ribbon or braid decoration around the edges as a protection against wear though plain skirts are fine. A top petticoat would be made identically to the first one, but gathering the second set of skirts into a tape tied at the waist rather than another waistband would ensure there wasn’t too much fabric all in one place. If you want to lift or tuck a skirt up, you must wear two to avoid displaying your smock (that would be like going out with your skirt tucked into your knickers). If one of your petticoats has a body attached, it should be worn as the underskirt of the two. 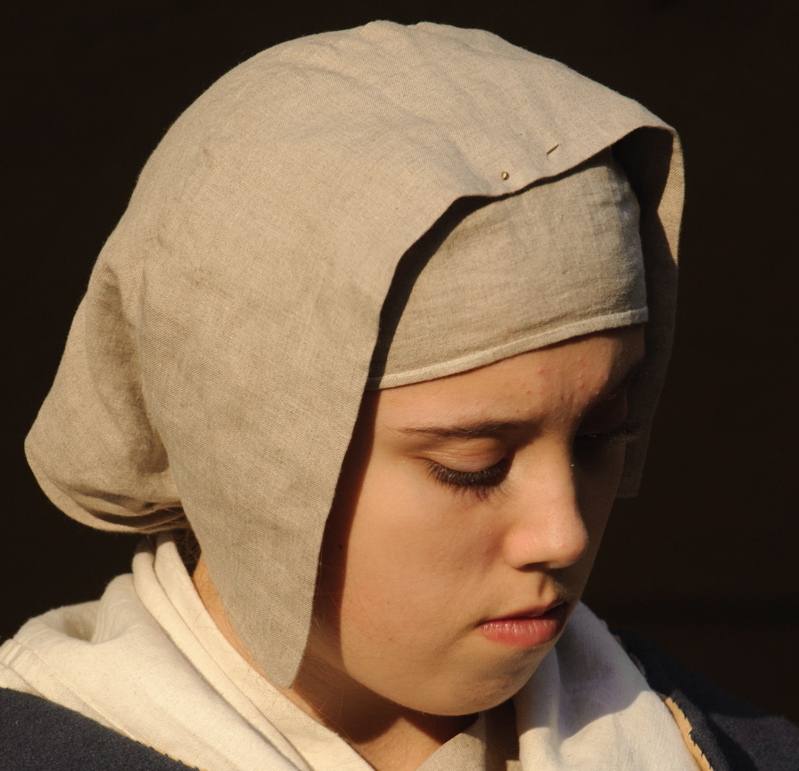 In this period most people kept their head covered indoors and out, so the most important accessory was a linen COIF or CAP. This was made of linen and was worn on its own or under a wide brimmed HAT. There are several styles shown in contemporary pictures, but the most common, and certainly the best represented in museum collections, come in two parts. The CROSSCLOTH was tied on first, to a bun of hair gathered behind and the COIF was then pinned onto the cloth. The hair would, in theory, be hidden from view for common women, although with coifs, part of the hair could sometimes be seen, combed back off the forehead. Serving women are shown, in contemporary pictures, wearing what looks like a length of cloth wrapped turban-style around their heads, instead of a sewn coif. HATS were often of blocked felt or, in the summer, straw, sometimes fashionably high-crowned or else fairly shapeless. A KERCHIEF was worn around neck and shoulders. In its simplest form, it was a square of unbleached linen or hemp folded diagonally, with the underside slightly longer and fastened with brass pins at the front. The ends are shown sometimes tucked into bodice fronts in paintings. It preserved modesty, protected the back of your neck from sunburn and, on cold days, kept your chest warm. A plain APRON would be worn for general work. This consists of a simple rectangle tied with tapes around the waist. 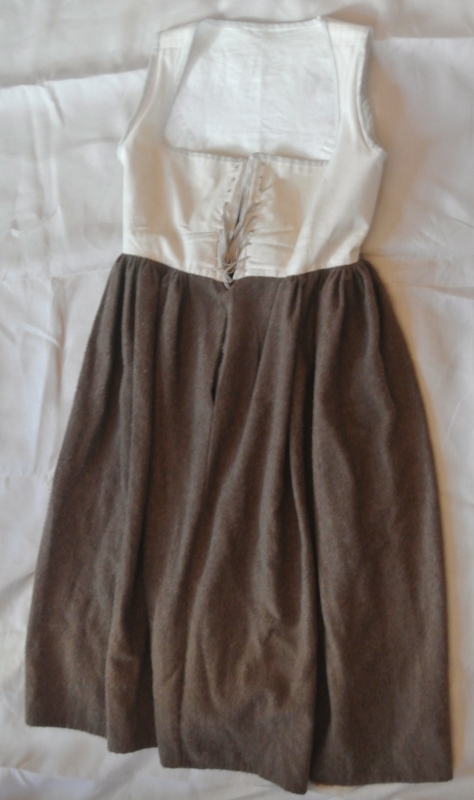 Decorated aprons were worn for ‘best’ and sometimes the more wealthy would also wear aprons over their petticoat skirts, perhaps embellished with braid or drawn thread work, but for the majority, plain linen or wool is fine. Woollen CLOAKS were worn in cold or wet weather. Cloaks were probably less common amongst the poor, who would probably make do with a rough blanket (or plaid north of the border). Some travellers may have worn leather ones. A cloak could be as simple as a semicircle of woollen cloth, worn around the shoulders with no fixing. 17th century SHOES are now known as latchet shoes from the name of the straps that come together over the instep to secure the shoe. Shoes seemingly reflected social status in the 1640s; those with heels were just coming into fashion, whilst low-heeled styles (see picturein the men’s section) were worn more frequently by commoners. A good shoe typically has three pieces on the upper, a round or square-ish toe and a short, straight side seam at right-angles to the sole, roughly level with the front edge of the heel. If cut-outs are present, they are symmetrical about the side-seam and the shoe should not have reinforcing pieces with visible stitching. Buy the best you can afford. They will fit your foot better and last for many years with care. by knitted or woven GARTERS or just simple strips of cloth. To summarise, you need a SMOCK, one or two PETTICOATS (with or without bodies), a BODICE or WAISTCOAT, a COIF, a KERCHIEF, HOSE and SHOES for your basic costume. 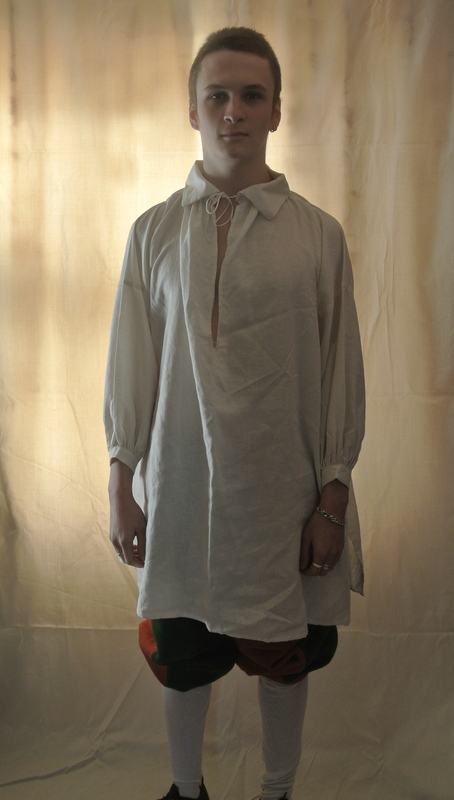 If your status is higher and a fashionable shape is required, you can wear BODIES between the smock and your top layer. If you must carry things with you, a leather bag can be hung from a belt around your waist or you may carry a basket. Pockets for women at this time are still ‘little bags’ and (we think) carried under a petticoat on a linen tape around the waist. The basic undergarment for all men was the SHIRT, a T-shaped, knee length garment made of linen. Shirts, like smocks for women, were seen as a barrier against disease, which was caused by dirt, so the shirt would be regularly washed. White cloth was available, though not as bright as the white that modern detergents can provide and dyed fabric far too expensive to waste on shirts. A soldier’s shirt would be of a coarser weave than a higher status one, but all shirts were basically the same shape. A rough shirt would have less fabric in the body and sleeves than a higher status one as it is easier to gather and tuck in larger amounts of fine linen. Shirts are pleated into cuffs for the sleeves and into a standing neckband for the body. Square pieces of fabric are folded into triangles and inserted under the sleeves to form gussets. The front opening should be long enough for the shirt to go over your head and tied at the top only with a single pair of tapes or bandstrings. 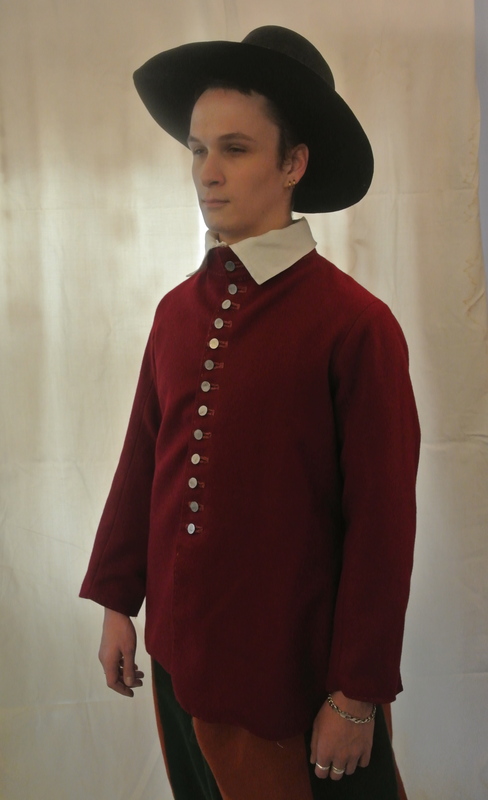 Shirts in the 1640s sometimes had small collars attached, typically twice as wide as the neckband though often there was no permanent attachment, just the standing band. If the shirt has no small collar, a length of linen or handkerchief can be worn tied around the neck. 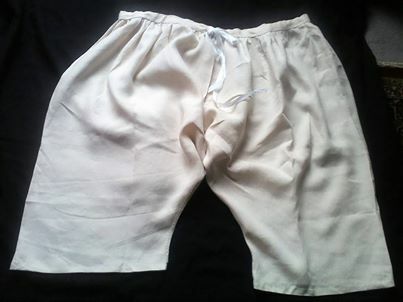 If you don’t want to go commando on the field but wish to be correct under your breeches, the evidence suggests that linen DRAWERS like these (left) were worn by lower class men, as night attire but also probably during the day, certainly for watermen and sailors, possibly for other walks of life. Over the shirt a SOLDIER’S COAT was worn. Coats were often made in quantity, so the fit was not exact and as far as we can tell, in no way uniform in cut or colour, even for regimental issues. The simplest style is a square loose-fitting garment with body and tabs cut in one piece, though there are many variations possible-shoulder wings and curved tabs for instance. They could be lined, depending on how much money a Colonel was prepared to spend on clothes. Coats were fastened down the front with several closely spaced buttons, a dozen at least on a soldier’s coat. Pewter or cloth buttons were used, and were usually spherical, although it’s thought that some issue coats had flat buttons. They shouldn’t be pierced through like modern buttons but fixed to a single stalk or shank. Cloth buttons are more comfortable on a soldier’s coat if you are going to wear armour. If a coat wasn’t issued, as in the case of trained bands or garrison troops, a DOUBLET would be worn, sometimes with a coat as well. Doublets were always higher quality and could be made of wool or linen. They would be lined and often tailored to fit with interlining and padding. Sleeves are close fitting, sometimes with turned-back cuffs, open seams and wings over the sleeve tops. Collars were high and stiffened with layers of canvas or pasteboard. The front closed with several buttons, twenty at least. Doublet buttons can also be made from wooden beads wrapped with thread. 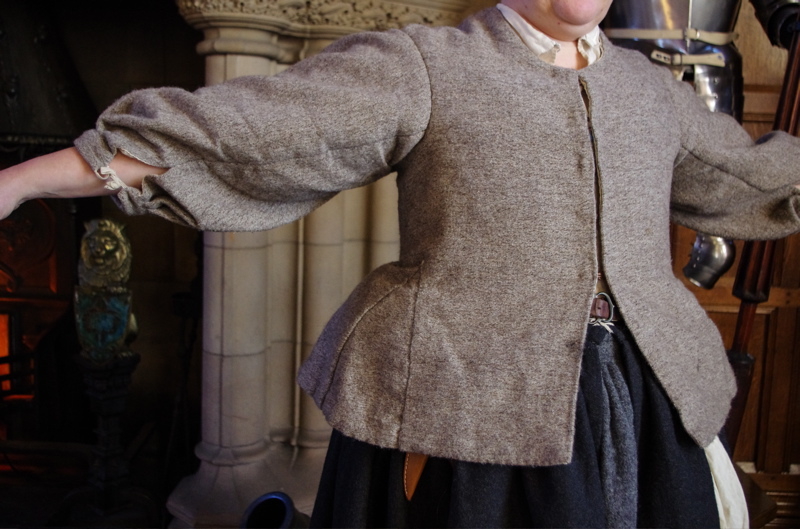 The overall length of a doublet including the tabs is to the hips, not the thighs like modern jackets, and the upper body section may end above the modern waistline. Inside the doublet at waist height a line of steel eyes would be sewn to a linen strip called a girdlestead, which matched up with a set of hooks on the waist of the breeches. In fact it can be argued that one of the main reasons for wearing a doublet was to keep your breeches up. BREECHES were made from wool or linen, of a limited colour range (brown, grey, dull green for instance), and are not necessarily the same colour as the coat unless you are in a regiment where there is record of breeches being issued together with coats. Style depended on class and geography, unless issued by the regiment. Men from country areas far from the cities wore an old-fashioned shape, full and baggy. 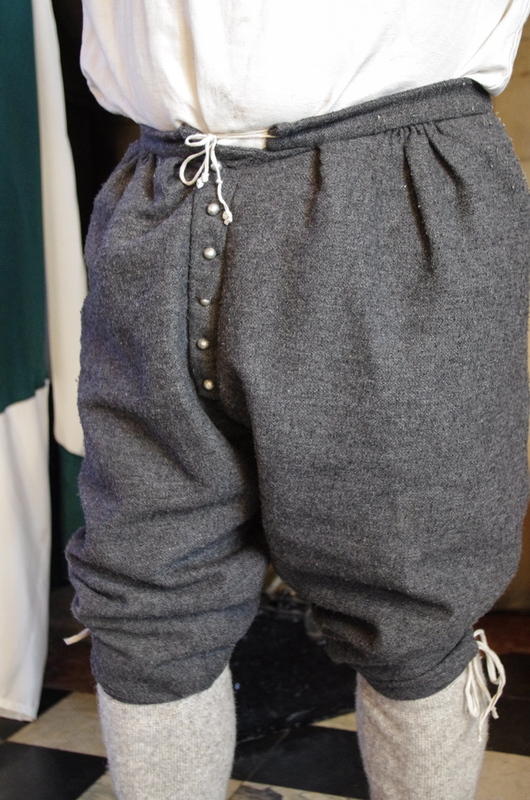 A more modern style, possibly copied for issued breeches, has narrower legs, and less fabric in the seat. The legs of both kinds can be left un-gathered (unconfined) or tapered in below the knee to a tight fitting band. Both styles may have had pockets in the side seams at the hip. 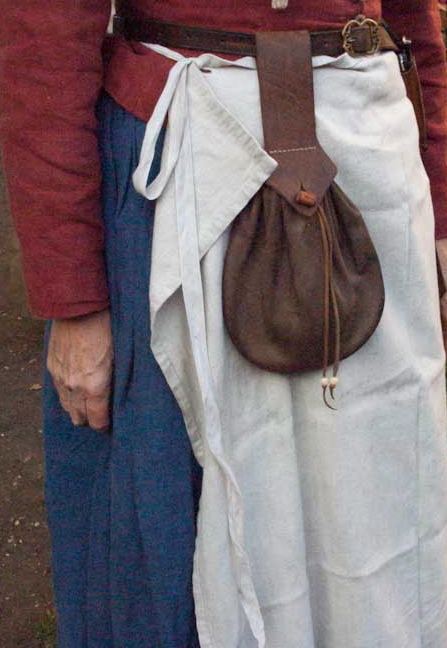 Surviving pockets from the period are simple leather bags, though linen works just as well. 17th Century SHOES often had side cut-outs and were made on straight lasts so that until they had been worn there were no lefts or rights. Although close-sided shoes would appear more practical, it is believed that open sided shoes may have been issued to soldiers, as they would fit a wider range of foot widths. Better status shoes were beginning to have high heels but were impractical in the field. Basic styles may not have had any true heel at all. The uppers were typically made of only three pieces of leather sewn together edge to edge, two pieces at the side and one covering the instep and the toes, which could be round or square. The side pieces would extend into a strap or latchet fastening which has become the modern name for these shoes. The side seams were much further back than is typical on modern footwear, roughly level with the forward edge of the heel. Don’t scrimp on your shoes. The more you spend, the longer they will last. This style of shoe is also acceptable for lower class women. An old fashioned, rural style of calf boot known as a STARTUP may have been worn by some soldiers, although there is no evidence of any issues of this type of footwear. 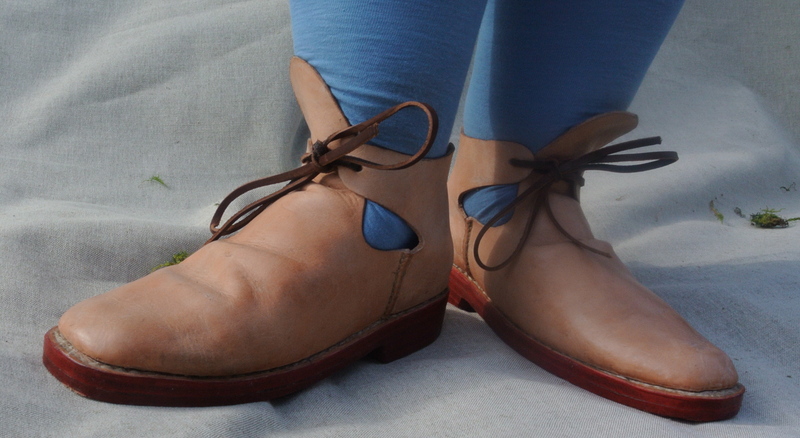 They would have been made using the same construction techniques as shoes, and may have been fastened with laces, buttons or toggles. Long BOOTS can also be worn in special cases. They were originally designed for use on horseback, and so were worn by those who rode, or wanted to give the impression they did, such as officers, cavalry troopers, dragooners and fashionable gentlemen. HOSE were worn to just around the knee. 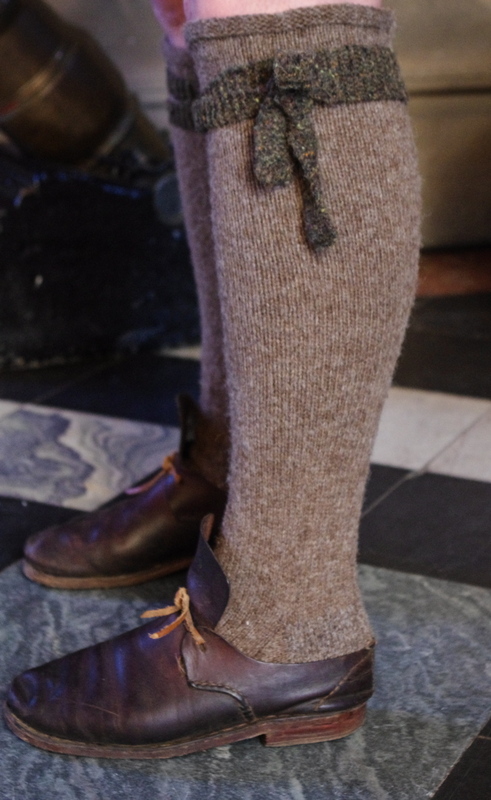 A contemporary pattern describes a knee-high stocking, turned down over a tied garter. You can buy woollen hose or get someone to knit you a pair-there are surviving patterns available. Shaped linen or cloth hose were also worn. As for the women, hose were held up by knitted or woven GARTERS or even just simple strips of cloth. Men of all ages kept their heads covered almost all the time. In church for instance, even though the established authorities frowned on the practice, those of an independent nature kept their heads covered. HATS or CAPS were doffed when you met anyone of higher social status. For the battlefield, headgear is determined by your fighting role. Pikemen wear morion helmets and musketeers a hat, cap or bonnet. 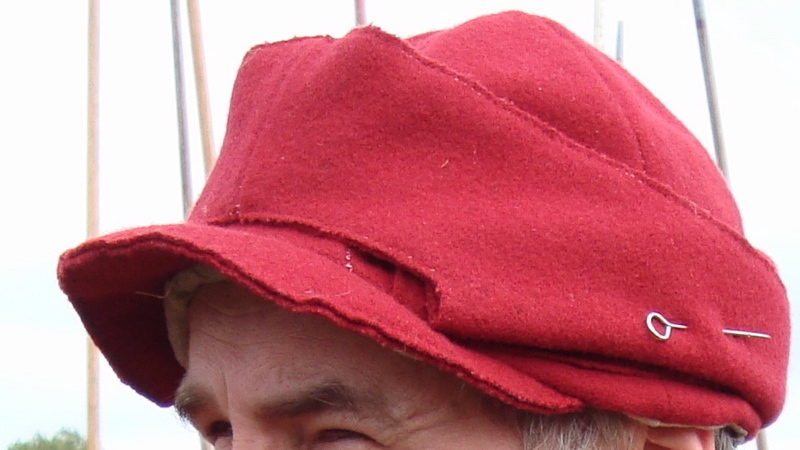 The simplest was the MONMOUTH CAP, a style of knitted woollen cap, heavily felted. It may have been a fairly high conical shape with or without a brim round the edge. Knitted and felted BLUE BONNETS were similarly made, but were mainly a Scottish item and should only be worn by Scots units and some northern regiments. 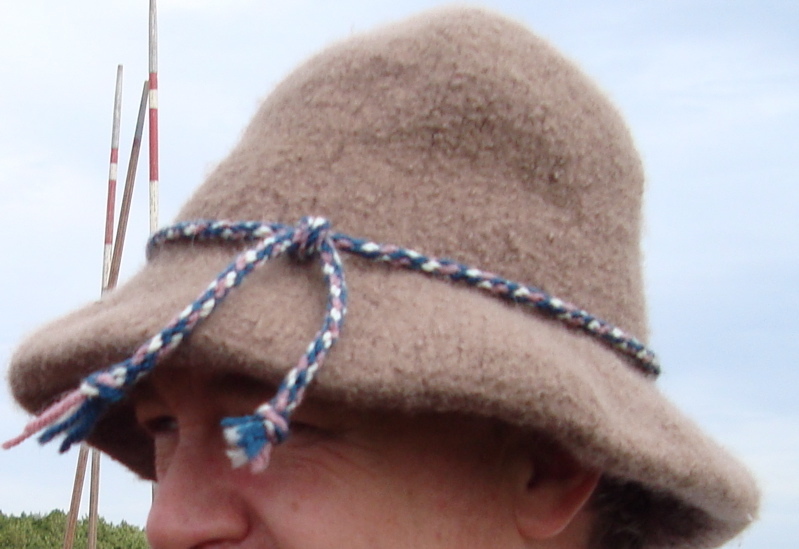 A MONTERO was a round peaked cap made of segments of woollen cloth with a skirt running around the edge that could either fold down for protection in bad weather or up for a stylish peak. Broad-brimmed HATS were also widely worn, either made from blocked and felted wool/fur or leather. Soldiers in the field carried their possessions; spare shirts, food etc. in a SNAPSACK, a sausage-shaped canvas or leather bag sewn to a leather strap or cord that passed diagonally across the chest. Other smaller accessories could be carried in a leather pouch or bag that hung from a waist belt. 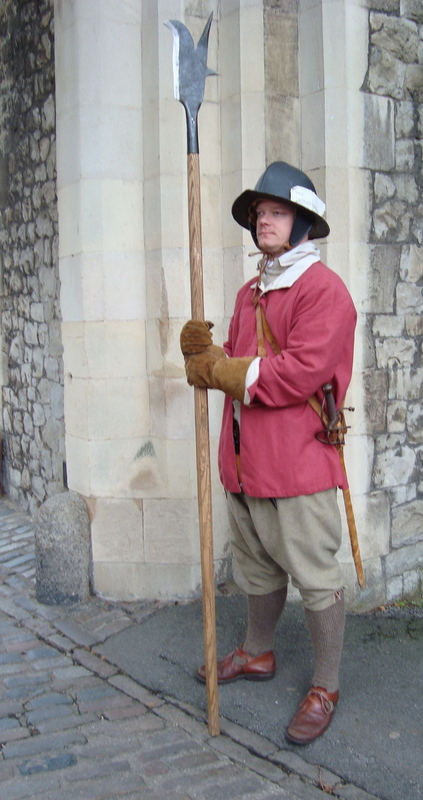 To summarise, a soldier’s basic costume-regardless of the fighting arm chosen or the army that you join consists of a SHIRT, a pair of BREECHES, a COAT (or DOUBLET, or both), HOSE, SHOES and a HAT. The coat will be of a colour and cut chosen by the colonel who raised the original Civil War regiment. Sometimes, this applies also to breeches and, occasionally, to hats. Extra clothes, rations and other possessions can be carried in SNAPSACKS, and smaller pieces of kit in a BELT POUCH. CLOAKS, or a length of ragged wool or oiled cloth for use as a CAPE in the rain, may also be worn.